Hundreds of refugees fleeing the political violence in North African arrived on the tiny Italian island of Lampedusa Monday. Coast guard officials say 10 fishing vessels arrived early Monday with close to 850 people on board. Another boat has been sighted in the waters off the island and now that weather conditions have improved more are expected to follow. The new arrivals are given medical assistance, a hot drink and warm clothes. They are then identified and screened to see if they are asylum applicants requesting refugee status or simply economic migrants looking for jobs. Most of the recent arrivals are young men. But there are also young women like Fatma, who arrived this week on one of the boats that made the crossing from Tunisia. She says she arrived from Djerba. She is happy to have made it to Italy because there is no work back home and the situation is complicated. She says people are being killed. Lampedusa officials say the island may be experiencing the beginning of a massive exodus of people fleeing the violence in North Africa. Bernardino De Rubeis, Lampedusa’s mayor, says a commitment is needed from the European Union. He says the EU talks about economic aid, but says it must also open the doors of its territory, because the risk is that Lampedusa and Italy will be overwhelmed…. 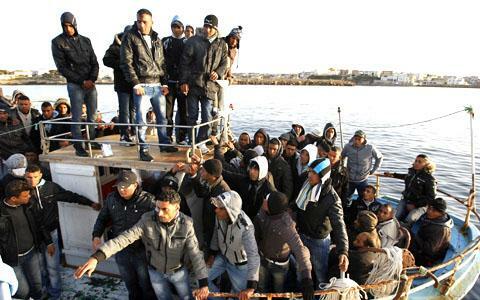 Posted on March 29, 2011 April 2, 2011 by NGO MigrationPosted in WUNRN UpdateTagged Italy, North Africa, Refugees.